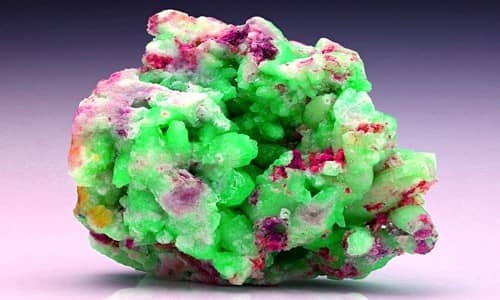 Leadhillite is a lead sulfate carbonate hydroxide mineral, often associated with anglesite. It is a monoclinic mineral of a yellowish or greenish white color consisting of basic sulfate and carbonate of lead. It has the formula Pb4SO4(CO3)2(OH)2. It can fluoresce a pale yellow under ultraviolet light. It will decompose in hot water. Heating will result in a reversible alteration to susannite. Leadhillite is named after its aptly named type locality of Leadhills, Lanarkshire, Strathclyde, Scotland. It was named in 1832 after the locality. Colour: Colourless to white, grey, yellowish, pale green to blue. Leadhillite is a soft mineral, with hardness only 2 1⁄2 to 3, a little less than that of calcite. It is heavy, due to the lead content, with specific gravity 6.55, similar to other lead minerals such as cerussite (6.5) and anglesite (6.3). It forms transparent to translucent variably colored crystals with an adamantine luster. It is quite soft with a Mohs hardness of 2.5 and a relatively high specific gravity of 6.26 to 6.55. Leadhillite is soluble with effervescence in nitric acid HNO3, leaving lead sulfate. It forms in the oxidation zone of lead deposits as a secondary mineral, sometimes pseudomorphing other lead minerals and sometimes being pseudomorphed by other lead minerals. Leadhillite is an uncommon mineral in oxidized lead deposits and in addition to Scotland, can be found in England, Austria, the United States, Namibia, and Australia among several others. The type locality is the Susanna Mine at Leadhills, Strathclyde, Scotland, UK. 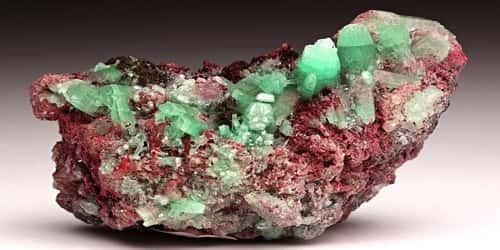 Leadhillite is a secondary mineral found in the oxidized zone of lead deposits associated with cerussite, anglesite, lanarkite, caledonite, linarite, and pyromorphite. It may form pseudomorphs after Galena or calcite, and conversely, calcite and cerussite may form pseudomorphs after leadhillite. Heating leadhillite causes it to reversibly transform into susannite.